that's a great layout Alex! and a really nice delay. in the vid the repeats control does not oscillate. am i right? that's the first time i'm seeing that with a pt chip. do you think that leviathan works that way too??? mmm... i think i'm gonna give it a try anyway...i said no more delays but...!!! From what I can see Brian's schematic is identical to the original except a few components values. I suppose it should sound the same. If you want to add an extra modulation circuit of your choice. Hi Alex, if i were to add extra mod circuit, delay 2-3 goes to the IN of the mod board, and where does the OUT from the mod circuit connect to? thanks! There is no input in the extra Modulation board. Just one output that goes to Delay 2&3. Thank you very much Alex... learned a lot from you guys. Will start to build this by the weekend. Try using the modulation circuit from Madbean's Dirtbaby & ZeroPoint Mini, it works for me and I have the option of switching from short chorus like and a wider modulation. Verified! Nice delay. Really like the repeats on this. Great! Cheers Gavin. I'll tag it. yeap....i've build that one too. the tone pot does almost nothing to my ears..maybe it's my guitar, or amp. i don't know. also level acts more like a mix control as i expected. i'm working on this for the last week.i drew and build an other perf bord layout just for fun cause i'm accidentally stack with 5 big boards and wanted to use them. it came out relly small(12x24), but too noise, so i've rebuilded it on vero. To comment on that tone pot. My tone control on the deprofundis built also did (almost) nothing to my ears. yeah...i'm sad about that...i really wanted to box this...but as i see it, my deep blue delay is much better at this point.. i'll keep the board in case we fix the problem though..
You could try upping the 68n on Tone 1 to 100n or more....OR increase the Tone pot to 20K plus. Both changes "should" dramatically alter the corner frequency of the LPF. Hi, did you solve the problem with the tone? I found there's one cap missing in this version compared with the Madbean version, could that be the problem? Which version? The layout? I'm quite sure it matches Madbean's schematic. 29 caps. Which cap would be missing? I'm sorry! I was missing the 1n one from the sixth pin of the tl072, my mistake. How to make it sound brighter? Where do I solder LED -? 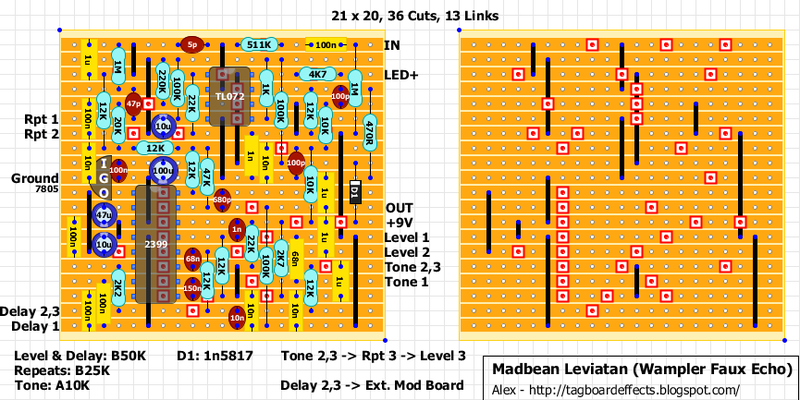 I don't see any LEDs in Madbean's schematic..
That's for you bypass LED indicator. Wire it to your stomp switch like you would on any other build. The 4K7 to the left of LED+ is its current limiting resistor. Adjust this value for your preferred brightness. I'm still a noob with building pedals, so please excuse the question, but has anyone put this into an enclosure yet? I see Madbean is calling for a 1590BB, but it looks like it **might** fit in a 125B. Any thoughts? Thank you for any assistance offered. In theory the vero could fit in a 1590B enclosure. Should have no problems with a 125B. I finished this delay and added the modulation daughterboard from the Deprofundis post, it works fine, except the switch gives modulation only/delay only/delay only, I tried swaping time 1 with time 2,3 but then I obtained modulation only/delay only/modulation only. What would be the problem? PS1. I postred this issue there but have no answer yet. PS2. Thanks for this blog and sharing so much info! Maybe it's not exactly what you were asking, but this helped me add the modulationon board you mentioned on a DBD and have modulated repeats. Look for the answer by slacker about the rebote, towards the end of the page. Thank you! I did what slacker says there and I finally obteined modulated delays, but unfurtunately the other positions of the switch did no effect at all. I tried several ways of wiring the switch and I couldn't get the three options. I think I will try with a 6 pin switch on/off/on. Thank you again! Yes, unfortunately it doesn't solve the switch problem, it just gives you modulation on the repeats. But it can work with a different switch as you said. Glad it helped! Got the tap tempo to work. How did youvget it to work with taptation? I'm counting 36 cuts, is that right? Sounds great! Could this be modded to keep delay trails in bypass? has anyone added a mod board to this? i've built two different mod boards that are certainly making a modulated sound but seem to drastically affect the delay time, making it really short. any ideas? Built this on a whim last night. Buddy bought a real one said its fantastic, IT is Fantastic , It sounds exactlt like an analog delay just killer. Thanks Alex and Madbean and Mr Wampler . I have just finished this one complete with the modulation daughterboard from the Deprofundis build. I scrapped the three stage switch and opted for delay/delay+mod as I also couldn't get it working as described, I also noted that when modulation is enabled the delay is increase significantly... Can get some really nice noises from it though! Just to clarify, is this correct? I've connected them from the daughterboard to the Delay pot lugs (which goes directly to the circuit, this shouldn't be a problem, should it? Has anybody tried this with thetaptation? I can't get mine to work. Is there anything I have to do besides what's required to add the taptation? If I'm only getting 3 repeats max, does anyone know which component (s) to target first for troubleshooting? I've already tested the pt2399s I have in a working circuit and that's fine (I bought a few in case). Also swapped in a few tl072 chips but no different. Just finished building this, but I can't find any delay signal after probing the PT, R10, repeats pot, etc. Bypassed and engaged sound exactly the same with no audible pop or change in the signal when the switch is pressed, but the board is definitely getting a clean signal (as shown by the probe). I tried a few different chips to make sure it wasn't a bad delay chip, and the voltages look pretty good on both chips (although a bit high on 7 and 8 of the PT). Any thoughts? I realize this kind of troubleshooting isn't efficient, but perhaps there are some areas to check right off the bat? Also, I didn't plan on adding a mod board to begin with. I assume that it should work just fine without...? How would you wire a killdry switch on this pedal ? It may have been covered previously but if I don't want to use an external modulation board, do I just leave Delay 2 and 3 unconnected or do they need to run to some other internal location? Sorry if that's a dumb question but that seems to be my specialist subject! GOOD AFTERNOON. HOW CAN I GET MORE TREBLE AND SERIOUS IN TONE CONTROL?